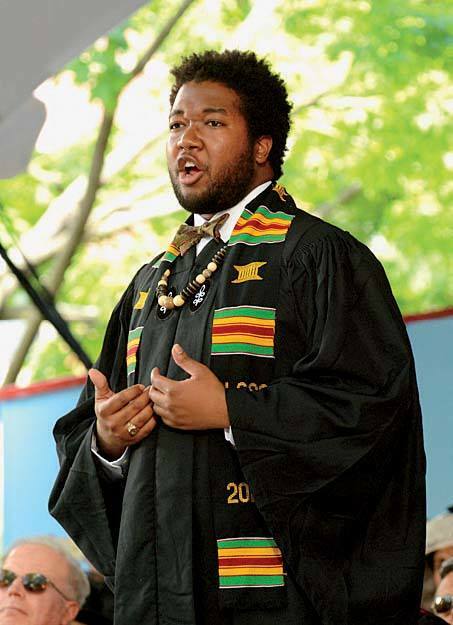 Joshuah Brian Campbell ’16 did double duty—nailing his Senior English Address during the Morning Exercises but also, literally, singing for his dinner the night before. At the honorands’ banquet in Annenberg Hall, accompanied by guitarist Alex Graff ’17, he sang “Desafinado,” by Brazilian songwriter Antônio Carlos Jobim (a treat for Fernando Henrique Cardoso, in lieu of the usual classical selection). During the Phi Beta Kappa Literary Exercises Tuesday morning, the Radcliffe Choral Society, somewhat surprisingly, sang “We Are…” by Ysaye Barnwell (of Sweet Honey in the Rock); its charming refrain is well suited for graduates with attending elders: “We are our grandmothers’ prayers./We are our grandfathers’ dreamings./We are the breath of our ancestors./We are the spirit of God.” Josh Bean ’16 did the fresh arrangement of “Simple Gifts” for the Commencement Choir’s Thursday performance. Commencement-goers may have noticed that the United States is conducting a presidential election. It turns out that academics and their guests are fully capable of delivering political one-liners as punchy as those deployed on the hustings. Some samples: “We cannot will away or wall away the world” (former secretary of state Madeleine Albright, LL.D. ’97, at Harvard Kennedy School’s Class Day). “The ability to know, as former dean Jeremy Knowles used to put it, ‘when someone is talking rot’” (President Drew Faust, Commencement afternoon address, on the role of education in informing discourse). “We are a nation of immigrants, at least for now” (Steven Spielberg, Ar.D. ’16, in his afternoon address—before referring to his attending family member, his 99-year-old father). This year’s festival rites are the last for Grace Scheibner, Harvard’s first formal Commencement director, who retires after 24 such extravaganzas. Scheibner’s successor faces a job that combines logistics mastery with penetrating psychology (tending to visiting heads of state and entertainers) and exquisite diplomacy (weighing last-minute ticket requests). President Drew Faust gave her a richly deserved shout-out after conferring the honorary degrees. The studious Phi Beta Kappans annually recognize teaching excellence. This year, they honored Kiran Gajwani, lecturer and concentration adviser in economics, who runs the senior-thesis research seminar; Charles S. Hallisey, Numata senior lecturer in Buddhist literatures; and Brigitte A.B. Libby, lecturer on the classics and Allston Burr assistant dean of Pforzheimer House (who had an excellent excuse for being absent: she delivered a daughter on Saturday, May 21). It is a small sample, but all three are lecturers, not ladder faculty members on the tenure track—perhaps a subtle comment on teaching. In a big year for ROTC, Ensign Adam Gracia ’16 was joined at Wednesday’s commissioning ceremony by his U.S. Navy family: Captains Jorge Gracia and Nancy Gracia, and (right) Lieutenant (j.g.) Alexandra Gracia, his sister. President Drew Faust’s gift to the officers was Leadership, an anthology edited by Elizabeth D. Samet ’91, professor of English at the U.S. Military Academy, who came to campus the next day for her twenty-fifth reunion. “This is the best time to enter the job market in close to a decade,” FiveThirtyEight’s Ben Casselman informed fortunate graduates in early May. The Harvard Crimson’s senior survey (906 responses) offers confirming evidence, with 21 percent headed to consulting jobs, 18 percent to finance, and 14 percent to technology. (The subsets are amusing: 43 percent of male final-club members reporting are heading to finance positions; a higher proportion of respondents will be in finance and consulting than any class since 2007.) More than half of those entering the workforce expect starting salaries in excess of $70,000. Panelists at Radcliffe’s Friday conversation on “Building an Economy for Prosperity and Equality” lamented the small faction of College graduates (4 percent in 2016) entering public or nonprofit service. Canned oratory about life lessons congeals much graduation rhetoric. But sometimes, the talk becomes painfully real. “I am here today to thank you—for saving my life,” class day speaker Marcelle de Souza Gonçalves Meira, M.B.A ’16, shown here, told her Harvard Business School peers. Her husband and classmate, Pedro Meira, died last September from stomach cancer, and her remarks addressed this ultimate challenge. The College class of 1991 elected as its Chief Marshal Sheryl Sandberg, who shares with Meira an HBS M.B.A. (’95), and the loss of her husband, Dave Goldberg ’89, little more than a year ago—the subject of her moving commencement address at the University of California, Berkeley, earlier in May. The Law School, having abandoned its shield, associated with a slave-owning family (see a decorated mortarboard), and absent a successor, hoisted plain banners on Langdell and in Tercentenary Theatre; stay tuned for the new design. In their anniversary years, the Harvard Alumni Association (175th) and Harvard College Fund (90th) hailed alumni community and philanthropy on the Yard’s light standards.